Beautiful spacious Apartment with stunning sea views and centrally located. Our beautiful up market home will offer our Guests everything they need. It is is very modern and a delight for Travellers who wish to have a luxurious holiday in a serene calm setting with amazing Bush and sea views. Our bedrooms are large and both ensuite with luxious Egyptian cotton linen. We have a large TV with the full bouquet of DSTV in a comfortable lounge with block out curtains for great viewing. A dart board, table tennis table and barbecue facilities finish off the holiday. Our dining room also has sea views. One bedroom has sea views and the other bush/garden views. We offer full free wifi. Laundry and cleaning on request for an extra nominal fee. Both bathrooms have luxury shower heads. Safe secure on site parking right outside the apartment. Beautifully designed with comfortable quality couches and a large flat screen TV. The lounge has awesome sea views and also has dark block out curtains. JUST WHAT I NEEDED: BETTER OPTION THAN HOTEL. Perfect home and space for a solo trip / couple or two couples! It is exquisite! Location is very convenient for the hot spots in Durban (south / north side). Easy access. Close to beach: sea view! Amazing kitchen! Had a great time in there with friends, eating, cocktails, and laughter. The rest of the home is exquisite! Elegant! This is a 5 star home that I will definitely utilize again when I am in the country. We thoroughly enjoyed having this apartment as our home-from-home for a few days. It was all and more than advertised. We found our hosts welcoming, warm and unobtrusive. 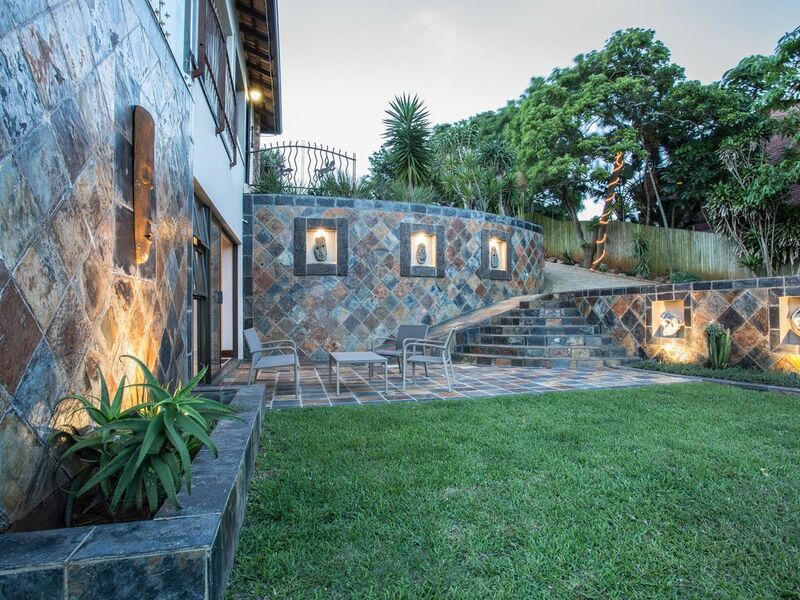 We gladly recommend this to those seeking a safe, comfortable place to stay in Durban North. Excellent view, spacious rooms, and wonderful hosts. This was the perfect place for a getaway with my elderly parents. The place was very accessible for my Mom who is in a wheelchair. The lounge, dining room and 1 of the 2 bedrooms have large windows making the most of the amazing view overlooking Virginia bush Reserve and the sea beyond. Dawn and Didierre are excellent hosts. We were left to our devices but our requests and questions were addressed within minutes. Umhlanga Rocks beachfront is less than 10 minute’s drive, and the promenade walk was perfect for my Mom to enjoy the walk along the beachfront. We absolutely loved staying at this location. It was nearly perfect for our needs and Dawn was great. The nature reserve and trails right near the house made for a perfect morning jog with my boys and Seattle Coffee Co just 1km from the house was perfect to cap it all off. Easy access to several grocery stores, the mall, great restaurants and beaches. The only thing lacking was block out curtains for the main bedroom. With a very early sunrise, it made it impossible to sleep in. Otherwise, we recommend this house without hesitation. Thank you for the awesome review. We thoroughly enjoyed you as Guests too. Regarding the curtains - this is the first time after 18months of our BnB being opened we have had this feedback! And will perhaps ask other Guests in future how they felt about it to get more input on it. But thank you, you have given us food for thought.